There's a ritual among athletes, especially boxers or other prizefighters, where they detach themselves from everything else in the world and concentrate solely on honing their bodies for a significant bout. Some stay around their home and gym locally, while others -- if they have the means -- might travel to a faraway place to better their focus. They eat purely, exercise extensively, and, most importantly, oftentimes abstain from sexual activity, and the results often lead to a form of euphoria or happiness about their triumph through their pain. Now, imagine doing all of this somewhat against your will for a goal or purpose that you're not even certain that you believe in, a theme that persists amid wartime conflicts. That becomes the central focus in Czech director František Vláčil's The Valley of the Bees (Údolí včel), a stunning portrait of a man sent away to train with the Teutonic Knights in 13th century Europe. Discussing the extent of the plot's developments, however, is difficult, as very little actually happens in the film -- even less so than in Vláčil more widely-known work, Marketa Lazarová. A young boy named Ondrej is hauled off to train with the monastic order after his father swears his life to religious service, following a violent incident at the father's wedding involving his young bride, a bowlful of flowers, several bats and a kid's tweaked idea of an innocent gesture. We move forward many years to the point where he (Petr Cepek) is now a weathered man attempting to stomach the rigid, pious ways of the Teutonic Order, all while honing his body through rigorous training and fasting. What's expected of him is a form of euphoric surrender to God's service, aided by the stalwart mentorship offered from model mason Armin (Jan Kacer), but his thwarting of the order to return home to his father's keep causes a stir. Other events do occur, especially as illustrative sub-segments, but this "fall from grace" is the meat of the matter. It becomes very obvious within mere minutes of starting Vláčil's film that he draws immense influence from Ingmar Bergman, especially from the likes of The Seventh Seal and Virgin Spring. His visuals are deeply profound and poetic, matched by equally dialed-in dialogue that leans more of the whimsical and existential than the practical. Early on, Ondrej floats with Armin naked in the sea nearest to their parish, where their dialogue eloquently dances around the holiness obtained through inflicting desire-equalizing pain on one's body -- emphasized by the frigid water numbing their lower bodies. Similar sequences centered in fundamentalist acts give The Valley of the Bees a thorough contemplative essence, from the process of losing everything in one's life as a way of finding God to pilgrimages for penance and fasting with only fish as nourishment. Vláčil concentrates deeply on making his experience genuine and entrancing for the eyes, yet it's all for the purpose of enveloping us in a realistic portrait of history so we might identify with Ondrej's fraught mindset.Whether the content appeals to one's curiosity or not, it's hard not to acknowledge the precision in Vláčil's reconstruction of the 13th Century European setting from a historical standpoint. Captured in 1968, the authenticity generated in the landscapes, interior shots, and through the knights' coats of armor is stunningly realized and could pass for modern grayscale photography. 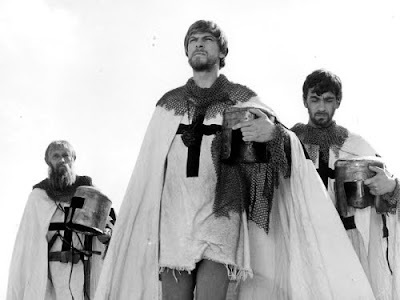 In conjunction with cinematographer Frantisek Uldrich's eye, his composition adds volumes to the film's weight as an existential piece of work -- capturing penitent statues carved into walls, rows of fish sitting before the knights at a dinner table, and a few striking images of both Ondrej and Armin clad with chainmail and cross-suggestive long swords. He also asks us to look upon gorgeous archways in courtyards and through windowsills in a way that transplants us to the time period, while also speaking to high-art with dense, earthy textures and expansive horizons with the period's buildings in their clutches. Vláčil's eye for the period and focus on fundamentalist imagery don't stop The Valley of the Bees from being a premeditated and demanding narrative, told with light story exposition and heavy existential contemplation. As a work of art, while just absorbing the aesthetics, it's satisfying on its own accord; however, they're dressings for an accurate and profound portrait of a man enduring a clash of faith predicated on his desire to return to his homeland -- and the rift his "human" whims causes with the Teutonic Order. Allegories are drawn between training the knights and orchestrating a pack of hungry dogs to hunt down their pray, tying in to the somewhat empty lack of reward generated by obeying the volatile orders of a higher master. In that, you'll also see a few surgically handled yet hard-to-watch images that Vláčil constructs, such as dogs hunting down a deer. This ties back towards the vicious punishment that the Masonic order exacted on another man who desired to stray from their confines, torn to shreds by dogs in a pit following a conviction from cloaked, stern members of his order. The Valley of the Bees engrossingly batches all this together amid its hour-and-a-half pace with its audience, proving that Vláčil's talent with existential thought and integrity breathes with the same essence as his influences. His performers are universally spectacular, natural but carrying a dramatic disposition in their eyes and facial mannerisms, all of which showcase emotional and mental turmoil that stretch beyond what they're allowing to the surface. That's the key with this style of picture, much like Max Von Sydow's recurring temperament in Ingmar Bergman's pictures. Vláčil concentrates deeply on making his experience genuine and entrancing for the eyes, yet it's all for the purpose of enveloping us in a realistic portrait of history so we might identify with Ondrej's fraught mindset. We're enveloped so that we might wrap our minds around a man's desperate yearning to separate from the blade-wielding service for a higher power, a duty that calls for the loyal to have nothing more, and simply return to his home. His journey, both the physical actions and the internal turmoil, fascinates.